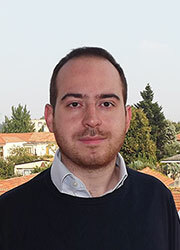 Riccardo Piccoli received, in July 2009, his Bachelor’s Degree in Electronic Engineering from University of Pavia (Italy), discussing the thesis: “Characterization of spectral and spatial profile of laser sources”. Then, in 2010, he received a Diploma in Piano from the Academy of Music and, finally, the Master’s Degree in Optoelectronic Engineering in July 2011 defending a thesis on tunable passively mode-locked Yb-doped fiber laser stabilized by spectral filtering supervised by Prof. G. Reali and Prof. A. Agnesi. In novembre 2011 he started a PhD related to the design, development and characterization of ultrafast passively mode-locked Yb-doped oscillators and amplifiers at the same university. He also investigated frequency down conversion in the mid-IR via parametric generation (OPG/OPA) as application of pulsed fiber lasers in MOPA configuration in collaboration with Max Born Institute (Prof. V. Petrov, Berlin). He then did a period abroad at Swansea University (Wales, Uk), Multidipliscinary Nanotechnology Center, under the supervision of Prof. S. Taccheo, where he studied Photodarkening effect in aluminosilicate highly Yb-doped fibers. This research was a part of the european project LIFT (Leadership in Fiber Technology, Grant 228587). Since February 2015, he joined INRS-EMT as a Postdoctoral Fellow under the supervision of Prof. R. Morandotti and Prof. L. Razzari, where he is investigating phenomena in THz photonics, nanoplasmonics and quantum optics. He has recently been awarded a FQRNT Scholarship. R. Piccoli, F. Pirzio, A. Agnesi, V. Badikov, D. Badikov, G. Marchev, V. Panyutin, and V. Petrov: Narrow-bandwidth, picosecond, 1064-nm pumped optical parametric generator for the mid-IR based on HgGa2S4, Optics Letters, Vol. 39, Issue 16, pp. 4895-4898, 2015. R. Piccoli, T. Robin, T. Brand, U. Klotzbach and S. Taccheo: Effective photodarkening suppression in Yb-doped fiber lasers by visible light injection, Optics Express, Vol. 22, Issue 7, pp. 7638-7643, 2014. R. Piccoli, H. Gebavi, L. Lablonde, B. Cadier, T. Robin, A. Monteville, O. Le Goffic, D. Landais, D. Méchin, D. Milanese, T. Brand and S. Taccheo: Evidence of photodarkening mitigation in Yb-doped fiber lasers by low power 405 nm radiation, IEEE Photonics Technology Letters, Vol. 26, Issue 1, pp. 50-53, 2014. A. Agnesi, L. Carrá, F. Pirzio, R. Piccoli and G. Reali: Low-repetition-rate, hybrid fiber/solid-state, 1064 nm picosecond MOPA laser system, Journal of the Optical Society of America B, Vol. 3, pp. 23435-3245. R. Piccoli, D. Méchin, T. Robin and S. Taccheo: Lifetime reduction due to photodarkening phenomenon in Yb-doped fibers and rate equation term, Optics Letters, Vol. 38, Issue 21, pp. 4370-4373. G. Marchev, F. Pirzio, R. Piccoli, A. Agnesi, G. Reali, P. G. Schunemann, K. T. Zawilski, A. Tyazhev, V. Petrov: Narrow-bandwidth, 100 ps seeded optical parametric generation in CdSiP2 pumped by Raman-shifted pulses at 1198 nm, Optics Letters, Vol. 38, Issue 17, pp. 3344-3346. A. Agnesi, L. Carrá, R. Piccoli, F. Pirzio, G. Reali: Nd:YVO4 amplifier for ultrafast low-power lasers, Optics Letters, Vol. 37, Issue 17, pp. 3612-3614. G. Marchev, F. Pirzio, R. Piccoli, A. Agnesi, G. Reali, P. G. Schunemann, K. T. Zawilski, A. Tyazhev, and V. Petrov: Narrow-bandwidth, mid-infrared, seeded optical parametric generation in 90° phase-matched CdSiP2 crystal pumped by diffraction limited 500-ps pulses at 1064 nm, Optics Letters, Vol. 37 Issue 15, pp. 3219-3221. A. Agnesi, L. Carrá, C. Di Marco, R. Piccoli, and G. Reali: Fourier-Limited 19 ps Yb-Fiber Seeder Stabilized by Spectral Filtering and Tunable Between 1015 and 1085 nm, IEEE Photonics Technology Letters,Volume 24, Issue 11, pp. 927–929, 2012. A. Agnesi, L. Carrá, C. Di Marco, R. Piccoli, G. Reali, and L. Tartara: Characterization of tunable low power Yb-doped fiber CW oscillators, Optics and Laser Technology, Vol. 44, Issue 5, pp. 1437–1441, 2012. R. Piccoli, F. Pirzio, Antonio Agnesi, V. Badikov, D. Badikov, G. Marchev, V. Panyutin, V. Petrov: Narrow-bandwidth, picosecond, 1064-nm pumped optical parametric generator for the mid-IR based on HgGa2S4, Paper ATu1A.2, Advanced Solid State Lasers, Shanghai, China, 16 – 21 November 2014. R. Piccoli, F. Pirzio, A. Agnesi, V. Badikov, D. Badikov, G. Marchev, V. Panyutin and V. Petrov: Narrow-bandwidth mid-infrared optical parametric generator based on HgGa2S4 crystal pumped by 16-ps pulses at 1064 nm; 6th EPS-QEOD Europhoton Conference, Neuchâtel, Switzerland, 24 – 29 August 2014. S. Taccheo, H. Gebavi, R. Piccoli, T. Robin, L. Lablonde, B.Cadier, A. Monteville, D. Mechin, D. Milanese, T. Brand and U. Klotzback: Photodarkening in Yb-doped Al-silicate fibers: Investigation, modelling and mitigation, Transparent Optical Networks (ICTON), 2014 16th International Conference on, Graz, Austria 6-10 July 2014. [INVITED] S. Taccheo, R. Piccoli, H. Gebavi, T. Robin, B. Cadier, D. Mechin, D. Milanese, T. Brand, M. Blomqvist, L. Leick, F. Salin, B. Valk, E. Grad, A. Malinovski, U. Hefter, T. Durrant and U. Klotzback: Photodarkening: Investigation, Measurement and Standards, Specialty Optical Fibers & Applications (SOF), Barcelona, Spain 27 – 31 July 2014. R. Piccoli, T. Robin, D. Méchin, T. Brand, U. Klotzback and S. Taccheo. Effective mitigation of photodarkening in Yb-doped lasers based on Al-silicate using UV/visible light, Photonics West (SPIE), The Moscone Center, San Francisco, CA, USA, 1-6 February 2014. R. Piccoli, T. Robin, D. Méchin and S. Taccheo: Impact of Photodarkening on Yb lifetime in Al-silicate fibres and on rate-equation system, Photonics West (SPIE), The Moscone Center, San Francisco, CA, USA, 1-6 February 2014. R. Piccoli, H. Gebavi, S. Taccheo, L. Lablonde, B. Cadier, T. Robin, A. Monteville, O. Le Goffic, D. Landais, D. Méchin, D. Milanese and T. Brand: Photodarkening mitigation in Yb-doped fiber lasers by 405 nm irradiation, Advanced Solid-State Laser (OSA), Paris (France), October 27th November 1th, 2013. R. Piccoli, S. Taccheo, D. Méchin and T. Robin: Lifetime variation induced by photodarkening effect in Yb-doped fibers, Advanced Solid-State Laser (OSA), Paris (France), October 27th November 1th, 2013. A. Agnesi, L. Carrà, C. Di Marco, R. Piccoli: Passively mode-locked Yb-doped fiber laser operating in the normal dispersion regime and tunable over the 1015 – 1085 wavelength range,. 14th National meeting of photonic technologies, Florence (Italy), May 15th-17th, 2012. Marchev, F. Pirzio, R. Piccoli, A. Agnesi, G. Reali, P. G. Schunemann, K. T. Zawilski, A. Tyazhev, and V. Petrov: Narrow-bandwidth, mid-infrared, seeded optical parametric generation in 90° phase-matched CdSiP2 crystal pumped by diffraction limited 500-ps pulses at 1064 nm, G. CLEO: Science and Innovations (CLEO: S and I) 2012 paper: CTh1B.5, San Jose Convention Center, San Jose, CA, USA, May 6th-11th, 2012. A. Agnesi, L. Carrà, C. Di Marco, R. Piccoli: Mode-locked ytterbium-doped fiber laser operating in the positive dispersion regime tunable over the range 1045 – 1065 nm, 2nd EOS Topical Meeting on Lasers (ETML’11), Capri (Naples – Italy), September 26th-28th, 2011.